What Other Special Editions Should Bugatti Make? 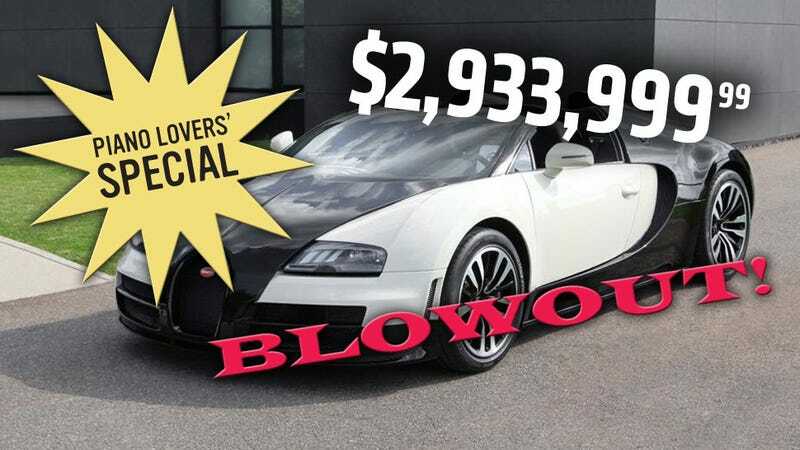 As you may have heard, it's Winter Blowout Time over at Bugatti, since they have to move 40 convertible Veyrons before they'll even think about making any more. It looks like they're using the Special Edition ploy to move cars, as evidenced by the new Lang Lang Edition Grand Sport Vitesse, named after the famed Chinese pianist. Seriously. The Lang Lang Edition features, of course, a black-and-white paint scheme (well, black carbon fiber), black leather seats, special door inserts with stitching that obliquely suggests piano keys, and Lang Lang's signature on the coveted footwell insert. That's right people — a signed footwell insert. I'm sure they'll throw in one of those skinny ties with the piano keys and maybe a new Casio keyboard too, if you ask nice, It also has 1183 HP and gets to 62 MPH in 2.6 seconds, which is considerably better than most pianos. We recently speculated about hypothetical "Signature Series" cars and since it looks like Bugatti took our article seriously, maybe we can give them some more help! Let's see what sort of great Special Edition Veyrons we can come up with. If you're good at Photoshop, maybe knock something out? I'm sure Bugatti will probably give the best ones a free Veyron or something if they decide to actually produce it. So, now's your chance! Think there needs to be a Nathan Lane Signature Series Edition Veyron? Maybe an International Bureau of Weights and Measures 139th Anniversary commemorative edition? Maybe a new Muppet Movie tie-in edition?